Systems implemented one year after terrorists fired an anti-tank missile at a yellow school bus, killing a Jewish youth. 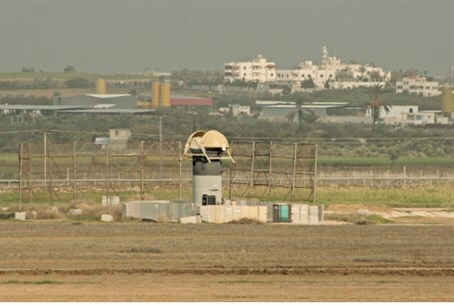 The IDF has implemented two new defensive systems to detect and deflect anti-tank missiles that are fired from Gaza. The systems are becoming operational nearly one year after terrorists fired an anti-tank missile at a yellow school bus, killing a Jewish youth. The systems were developed by Elbit Systems Ltd., enabling early detection and warning of launched anti-tank missiles as well as redirecting them. "Due to the anti-tank missile threat in the Southern Command, we've been looking for a means of detecting where missiles are launched from," the Head of the Southern Command Weapon and Technologies Department, Maj. Nissan Mizrachi, told the IDF Website. One of the new systems allows for detecting of laser-operated weapons and warns against possible threats. The technology detects the direction of the threat and its type, and it informs the commander in the field both visually and using audio. The system is based on the direction and speed the system calculates where the missile will land, and it can thus assist a tank, for example, to direct its fire at the threat. The warning provided by the system provides a 360-degree range. The second newly implemented system, also developed by Elbit Systems, diverts missiles that have been fired. The system redirects the missile using several different technologies, ensuring the vehicle carrying the system is not harmed. Both systems became operational in the past few months and provides defense against the growing anti-tank missile threat in the Gaza Strip region. The Southern Command has also paved a new road, which it says is safe from anti-tank missile threats, for use by Jewish communities in the area. The road's unique location in a land fold provides ultimate protection from anti-tank missiles. Observers believe that Israel announces its new defense technologies partly because it is interested in selling them abroad.